ZBrush is the most advanced 3D sculpting program out there. What separates it from other 3D tools is that ZBrush mimics traditional sculpting techniques all done digitally on a computer. Sculpting in ZBrush is akin to working with a digital ball of clay, shaping it as if you were working by hand. The sculpting tools from ZBrush allow a wide degree of creative freedom. Not only can artists create more organic and detailed models using ZBrush, they can often arrive at the finished product much faster than with other programs like Maya or 3ds Max. Developed by Pixologic, Inc., ZBrush was first presented in 1999 and officially released for PC and Mac in 2009. Today it is recognized as the most advanced 3D sculpting software on the market. With a large toolset and a wide variety of applications, it’s easy to see why ZBrush has become such a success. ZBrush is primarily a tool for sculpting high-resolution 3D models. Before tools like ZBrush came along, artists had to painstakingly create detailed objects using complex software and methods that made the task cumbersome, maybe even impossible. With ZBrush artists were introduced to sculpting using a paradigm borrowed from traditional sculpting: a ball of clay. Inside ZBrush artists can pull, push, squash, scrape, or otherwise manipulate the digital clay just like they were working with the real thing. The earliest versions of ZBrush came with 30 brush tools that allowed for a variety of different processes and more control. Using these brushes an artist can sculpt a digital version of almost anything they desire. 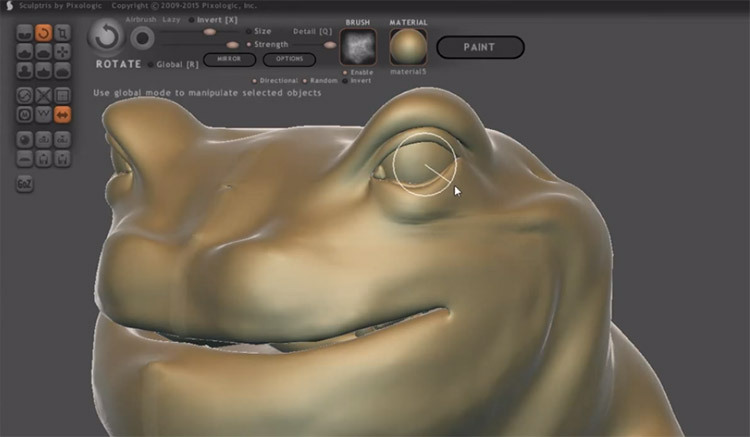 By manipulating a virtual surface in this way, the 3D artist can create detailed features like the scales on a dragon or the wrinkles in a person’s face. Such fine details are very difficult to emulate without tools like ZBrush. Thankfully this tool makes it easy to create highly detailed models for any kind of digital media. Talented designers can even mock up their characters directly in ZBrush, saving precious development time. The software allows artists to build all kinds of models ready for rigging or final production. While known primarily for the creation of organic figures with lots of surface detail, ZBrush is well suited for creating other objects such as vehicles or weapons too. Unlike traditional modelling software, there’s no need to manipulate individual polygons with ZBrush since it takes a whole different approach. ZBrush has revolutionized the 3D animation pipeline too. In the past, 3D animators would often need to create a low-resolution version of their characters in another 3D package. This low-resolution model is known as the ‘base mesh.’ This basic model would be used for animation due to restraints in hardware. But ZBrush changed all that by allowing artists to create their character designs with the full power of 3D sculpting start-to-finish. Now the artists can sculpt their ideal character in one program and work from there. Back years ago sculpting was once mostly used for fine-tuning a low-resolution model. ZBrush has reversed the trend and now artists are free to experiment with a high level of detail right from the start. Then later on artists can create another version of their sculpted model for animating. ZBrush prides itself on having a non-linear workflow. This means artists have more flexibility when it comes to how they approach their work. Other 3D software can be very restricting, requiring the artist to follow exact procedures to complete an end result. For instance, with some 3D packages artists must finish their models before creating a texture(the “paint” or surface coloring of the model). Changing the model would often mean losing a paint job. 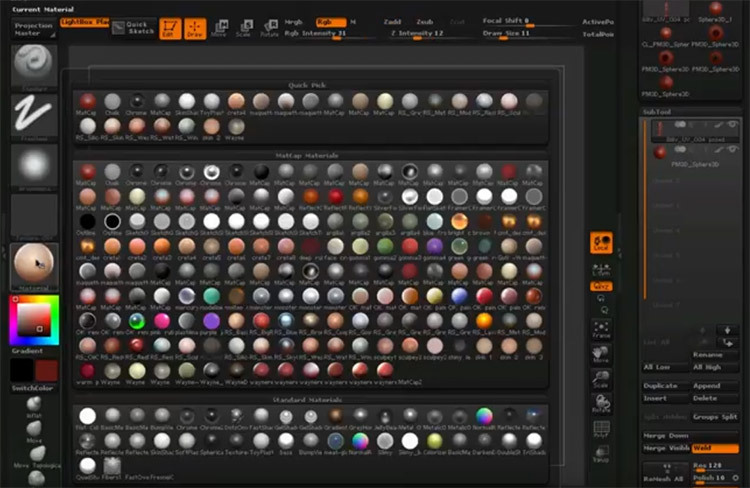 ZBrush allows artists to move freely between work modes without losing any information. What Is ZBrush Used For? Because ZBrush is used to create high-resolution 3D models for movies, video games, and special effects, the chances are very high that you’ve seen something that features art made in the program. 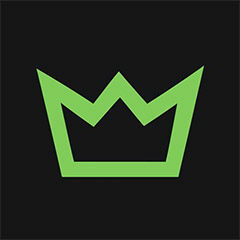 ZBrush is a common tool for professional film and video game studios all over the world. ZBrush artists are also employed in higher education, marketing, and wherever there is a demand for high-level 3D animation and effects. Most AAA games on PC and next-gen consoles are using ZBrush in their animation pipeline. By using ZBrush today’s game studios can put more detail into secondary characters and create elaborate worlds without adding to the development time. Games like “God of War” and “Assassins Creed” have benefited from these feature of ZBrush. One of the best concept art schools in the world, FZD School of Design, only has 2 required programs for studying concept art: Photoshop and ZBrush. You can see this in their enrollment section under the “equipment fees”. Those who study concept art and graduate from FZD with an entertainment art degree use only those two programs. That really says a lot about this software’s influence in the gaming world. But ZBrush is also popular among film studios and it even received an academy award for revolutionizing special effects. The ease-of-use allows artists to bring a director’s vision to life in days or even hours, reducing development time and improving results. Because it contains a state-of-the-art blend of 2D painting and 3D sculpting tools, ZBrush is a perfect match for concept artists. 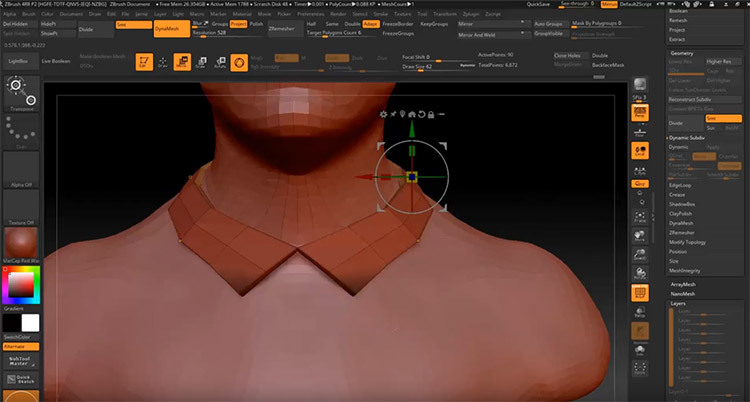 With built-in brushes that mimic real world media and dynamic modeling tools that let you shape objects in real time, it’s not hard to understand why ZBrush is so popular. Artists can achieve insane levels of surface detail on their models making this a great program for the finishing touches on a game or movie. Details like skin pores or crow’s feet can be brushed into the surface of the 3D object with relative ease. Movies like Star Trek, The Lord of The Rings, Rango, and the Pirates of the Caribbean have all made use of ZBrush to meld live action with virtual effects into a seamless experience. Despite its massive popularity ZBrush is affordable enough for small studios and independent artists too. Since arriving on the scene over a decade ago, ZBrush has firmly cemented itself as a major piece of software in the 3D animation universe. Easily the most advanced sculpting software on the market and really the industry standard. Artists pursing a career in animation, game design, 3D modeling, or special effects would be wise to develop their sculpting skills early. A great way to start on the cheap is by downloading Sculptris, a free alternative developed by the makers of ZBrush. Or if you really wanna dive into ZBrush have a look at our collection of tutorials tailored for all skill levels. With a low learning curve and a powerful set of 2D and 3D tools it’s easy to see why ZBrush has become the digital sculpting program of choice for everyone from art enthusiasts to major film & video game studios.